Provide comfort for the family of Annabelle Hicks with a meaningful gesture of sympathy. 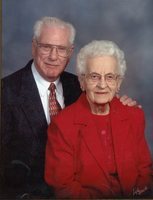 Annabelle Hicks (nee Wetzel), 99 of Petersburg, VA passed away on Sunday, April 14, 2019 at Sunrise of Carroll in Westminster, MD. She was the wife of the late Edgar “Randy” R. Hicks. She was born January 19, 1920 in Dornsife, PA the daughter of the late Charles W. Wetzel and the late Mary Wetzel (nee Lohr). She was employed by Prince Gorge County of Virginia as an Extension Agent in Home Economics. She enjoyed quilting, helping other people, feeding homeless, and Habitat for Humanity. She was the mother of Karen Hamilton and husband John of Mt. Airy: loving grandmother of Michael & wife Kansinee and James & wife Kristin Hamilton and great-grandmother of Venita & Seth Hamilton. Friends may call on Thursday, April 25, 2019 from 3-5 PM at Burrier-Queen Funeral Home & Crematory, P.A. 1212 West Old Liberty Road, Winfield, MD (Beside South Carroll High School). The Funeral Service will be held on Saturday, April 27, 2019 at the Lutheran Church of Our Redeemer 1769 S. Sycamore St. Petersburg, VA 23805 at 11 AM. Interment to follow at South Lawn Memorial Park. In Lieu of flowers memorial donations may be made to the Lutheran Church of Our Redeemer. To send flowers in memory of Annabelle Wetzel Hicks (Wetzel), please visit our Heartfelt Sympathies Store.